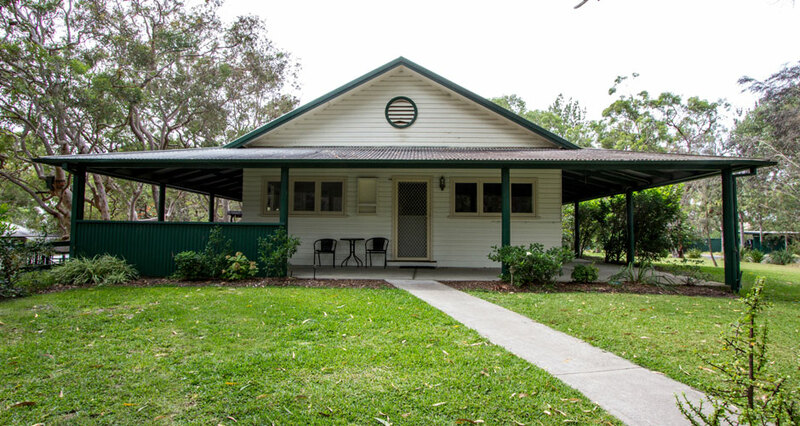 The Ranch is the latest building to become available as one of our group holiday houses NSW. The Ranch is one of our Group holiday houses NSW which is designed to accommodate families, couples or a small group. With 3 bedrooms, 2 bathrooms a huge open plan living/dining area, modern kitchen and private veranda and outdoor entertaining area. The Ranch is our most exclusive building on the property. Close to the facilities that we offer at The Retreat The Ranch has a very classic country homestead feel. Every room has opening windows, ceiling fans and blackout window coverings. There are TV’s located in the kitchen, large TV in the lounge/dining area and another in the 2nd bedroom. Other Group Holiday houses available at The Retreat include The Lodge which can sleep up to 24 guests in 6 bedrooms and this is a self contained building. The Duplexes can sleep up to 16 guests in each side or if you have a larger group of 30+ then you can book both Duplexes. There are internal doors which can be opened and this allows for internal access essentially making The Duplexes one building. Our Group Holiday Houses NSW are ideal for school camps, sporting groups, social groups, weddings and a corporation & function venue.